While visions of perfection danced in mom’s head. Ah yes, the night before the first day of homeschool each year. We go to sleep with visions of The Perfect School Year. We will be organized and intentional, the kids excited to learn. They will wake up, quickly get ready, and and eat a healthy, home-cooked breakfast. We will start our day with prayer and snuggle on the couch reading aloud together. No one will whine about doing his or her schoolwork. Instead they will ask for more. But then we wake up. Reality doesn’t quite measure up to our dreams. The kids don’t actually want to get out of bed. The baby was up in the middle of the night, so after sleeping a bit later, we reach for the box of cereal. And no one can find the read aloud. The book or resource or curriculum that was supposed to be perfect turns out to be less than perfect. I want to encourage you, though. It will be OK. Perfection is an illusion. It is in imperfection and difficulties that we often learn the most, when character is formed, and flexibility is forged. Our children grow and so do we. 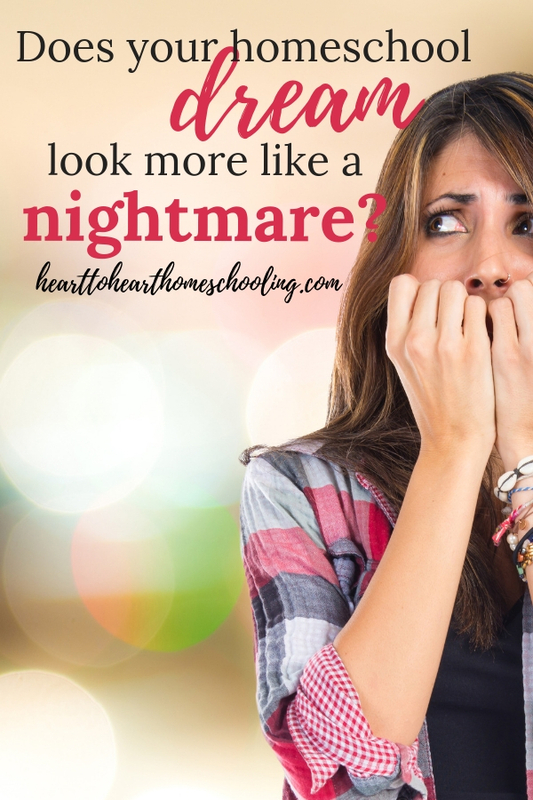 So what can we do when when the reality of homeschool strikes? As the new king, Solomon could have asked God for anything. But he chose to ask Him for wisdom. Wisdom and knowledge to lead the ones God had entrusted to his care. God has entrusted us with the care and education of our children. Have we asked Him for wisdom to do just that? There will be times when you just don’t know what to do— how to deal with obstacles, bad attitudes, disobedience, distractedness, frustration, and trouble “getting it” (and this list applies to both us and our children!). You will need guidance and wisdom from the One who knows your children better than you do. How often do you go to God first? But when there are difficulties in your homeschool, know at least one thing you can do. Notice this verse follows the command to “Count it all joy when you meet trials of various kinds.” Trials have purpose in our lives. They mature us. But we aren’t left on our own. He tells us to ask him for wisdom in the midst of them. So let’s start with prayer—on the days that aren’t going well and the days that are. After you have prayed for wisdom, know that God will give it to you! Instead of trusting a curriculum, book, or other resource—trust the one who created your children. If something isn’t working, then prayerfully evaluate it. Is there a way this resource can be adapted for my children’s learning styles? How can I approach teaching this subject or concept in a different way so my children will understand it? Can I make learning more enjoyable for us all? Do I need to address a detrimental character trait in my children or myself? God makes each of our children wonderfully unique. We have so many choices when it comes to what we will use to teach them. Before throwing out a book or curriculum because it doesn’t seem to be working, first think about how to adapt it to your children. And then if you have to, find a different resource. Teach your children. 3. Recognize the difference between goals and desires. When I don’t confuse desires and goals, I can let go of the results. I can trust God and always hope, no matter what the results are. The same is true for our homeschool. I may have a desire for it to look a certain way, and I can choose to work toward goals that will help. But when it isn’t perfect, I can trust the perfect one. What should we desire? Psalm 37:4 says, “Delight yourself in the LORD, and he will give you the desires of your heart.” I really do not believe this means we will get whatever we want. But as we delight in Him, our desires become aligned with His desires. John 15:7 says, “ If you abide in me, and my words abide in you, ask whatever you wish, and it will be done for you.” We want to skip to the “I ask, then You do for me what I ask.” But you’ll notice the first part. We must abide. His words must abide in us. Abiding involves love, obedience, trust, relationship. So abide in Him. Allow God to shape your desires. Pray. Be intentional. Then let go. Yes, some days our homeschool will look exactly like we imagined when we began homeschooling. Days where things go smoothly, our kids love learning, and our hearts join together in a common goal. We will learn and laugh together. But there are days when that won’t happen, too—even weeks or months when nothing seems to go as planned. And that is OK, too. Because we all learn and mature and grow in the process. We travel a road when we homeschool. And roads are often a bit bumpy along the way. Bends and curves, bumps and grooves, only make the journey better. Our homeschools don’t have to be perfect. I’m on the final lap with one freshman and one senior. This could be and is my story. Praise God it’s not too late to refresh the page, refresh my eyes, refresh my heart. Look forward, not behind. Helps the bike stay on two wheels, if that makes sense. Yes! We serve a God of redemption. Never too late to refresh 🙂 Praying for you now! I have those days where nothing goes right so drawling on the couch or back into bed and cuddling and just reading or watching a movie becomes our school that day. Or we do a Free day and do, nothing at all because sometimes we just need to rest and regroup. It’s like a reset button for school 🙂 Don’t you love a lifestyle of learning? Adapting as is needed. Yes 🙂 It is so important to be a student of our students so we will know! Aww I love this. “While visions of perfection danced in mom’s head” Ha! Couldn’t be more accurate. Yes! And it really goes by so much faster than you can imagine 🙂 I have to admit I LOVED CURRICULUM! All the pretty things. For some reasons my boys didn’t always agree. Ha! This is awesome. I am scheduling it on my page for all my home school mamas out there. Pinned too! Thank you so much for sharing this we have a 6yr old and we are homeschooling and we have moved and are really just starting and he is a gregarious child and less than thrilled. Things are getting better but this helps me know that mine is not the only one. No you aren’t the only one! But you can do this, and you will find your stride. Really good post and advice! I love #2. Occasionally, we would encounter a book that did absolutely nothing for us. It was like trudging through quicksand to read it, and it made us dread the subject or maybe even the school day. It was so freeing to just let that one go, as a homeschool mom to have the freedom to make that decision. I loved the look on my kids’ faces when occasionally a reader did the same thing for them and I gave them permission to skip it. You’d think they’d start trying that with all of their assignments, but they didn’t. They enjoyed most of them. It really isn’t worth it to force yourselves to stick with a particular book, in fact it can make homeschooling even harder.